Tonight rain is expected to occur across parts of eastern Nebraska and western Iowa. The heaviest amounts, from one quarter to three quarters of an inch, should occur south of a line from about David City to Bellevue and Red Oak. 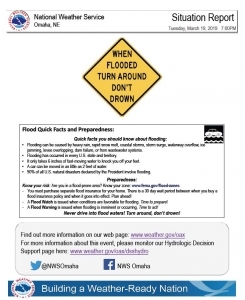 A Flood Warning remains in effect for a large portion of East Center and Southeast Nebraska as well as Southwest Iowa. 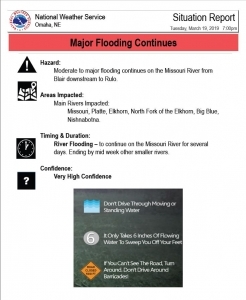 River flood warnings continue for the Missouri River, the lower Nishnabotna River, the Big Blue River. Flood warnings also continue for the lower part of the Platte River downstream from Louisville and for the North Fork of the Elkhorn River. Widespread flooding along rivers and streams will continue through tonight across most of eastern Nebraska and southwest Iowa. This will be especially for the Missouri River, the lower Nishnabotna River and parts of the Big Blue River. 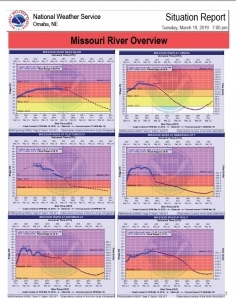 Wednesday through Monday Moderate to major flooding will continue for some areas in the mid and later part of the week. 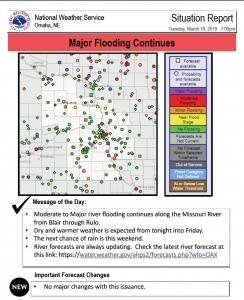 Flooding along the Missouri River is expected into early next week. Another storm system moving into the region this weekend is forecast to bring periodic chances for rain from Friday night through Monday.